"The musical equivalent to bazooka bubblegum stuck to the bottom of your combat boot." "A Punchy, punky young oldies sound. Hayley's vox immediately remind me of Belinda Carlisle and the music itself says drive-in movies, bubblegum, soda pops, lazy beach days, and mild teenage bad behavior." "Syrupy-sweet, surf pop punk songs cover topics like hooking up in the backseat, mermaids, glitter, and young love." 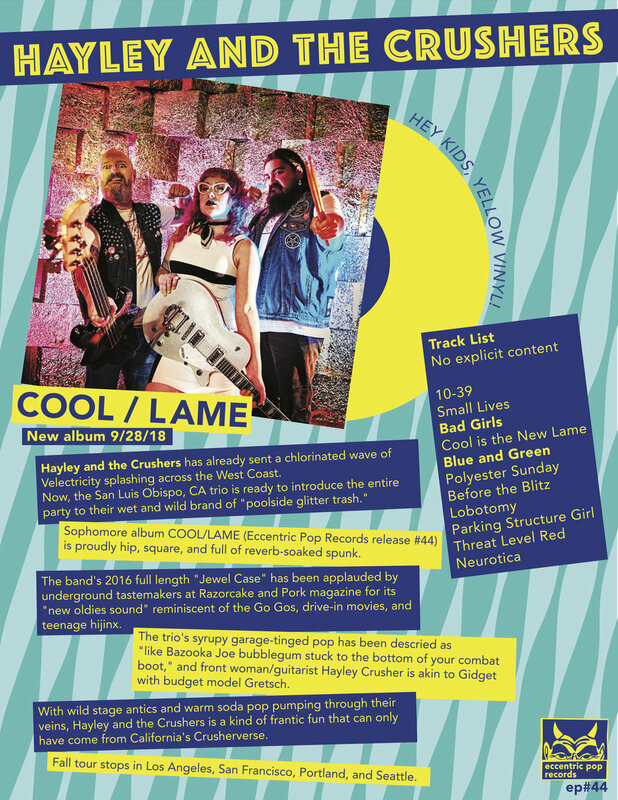 "This CA trio has created their own unique grit and glitter blend of 50s rock’n’roll with a punk attitude, like an alternate universe inspired by Marty McFly’s wild performance from Back to the Future." "Early Go-Go’s recordings are the most frequent touchstones cited in reviews of Hayley & The Crushers, a comparison that tends to overlook the fact that the latter band is two-thirds male and clearly favors glittery surf-punk over sparkly vocal harmonies. But Hayley and company have, in fact, recorded a spot-on version of “This Town,” while original tracks like “Hotshot” could pass for forgotten Go-Go’s B-sides. On their 2016 debut album Jewel Case, the San Luis Obispo trio dabbles in the kind of 1960s girl-group sass and wall-of-sound arrangements that suggest repeated conjugal visits with Phil Spector. Any risk of saccharine sweetness, meanwhile, is mitigated by Hayley Crusher’s psychobilly guitar riffs and Reid Cain’s chronically distorted bass, which sounds like it’s being playing through a Fender Bassman whose speakers were blown at least four decades ago."